Parking is available in the covered parking garage located between Bryn Mawr and Balmoral Ave. When parking in the self-park areas of the garage, park closest to the Aloft / South end spots, which are closest to Bub City & Joe's Live. Head towards the exit to the park, and Bub City / Joe's Live will be to your left (south end of the park). Valet parking in the garage is also available. 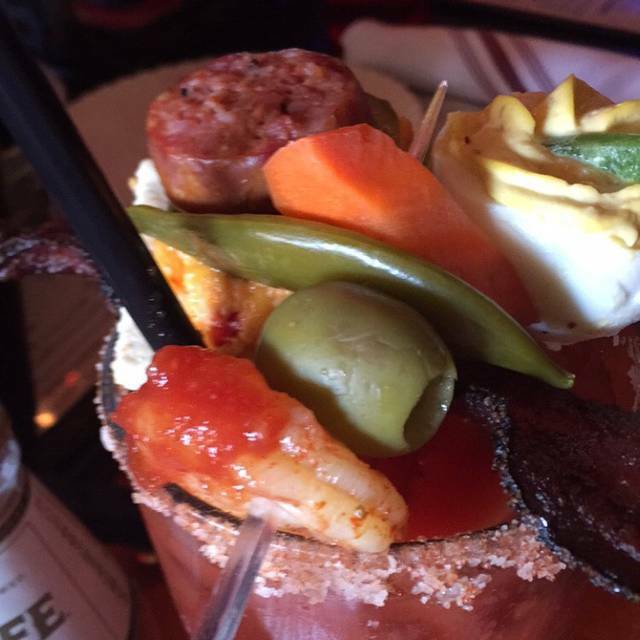 Their Bloody Mary bar is amazing! 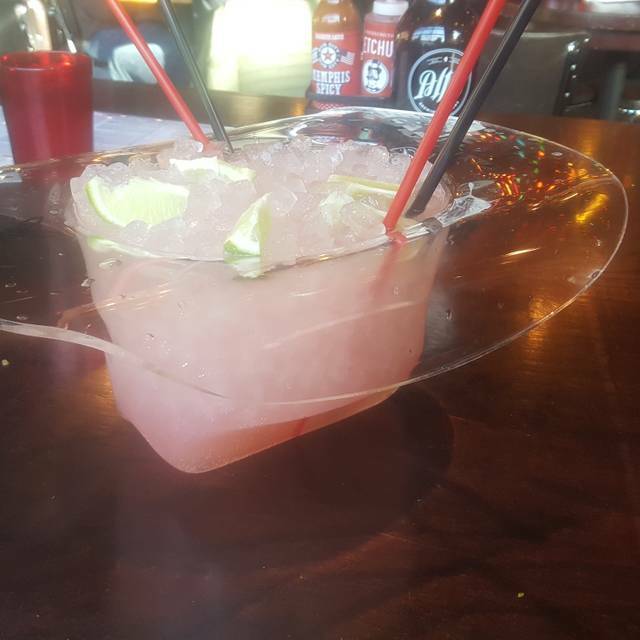 Recommend asking the bartender for the secret to getting the most stuff on your drink! 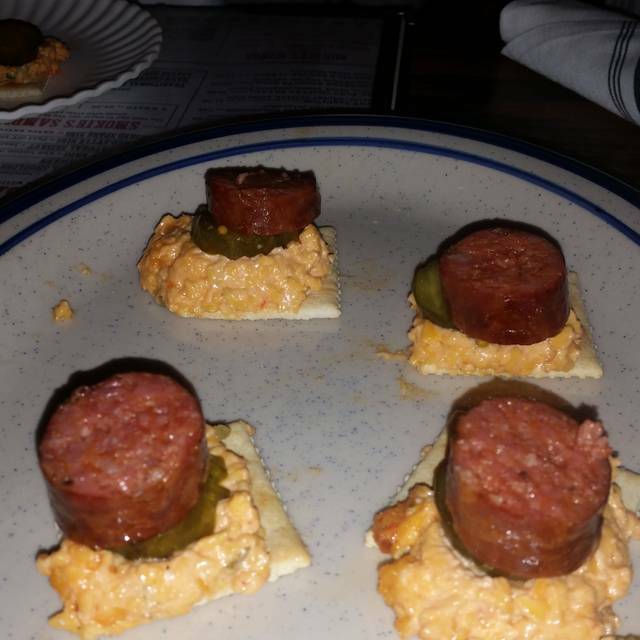 Loved the grilled cheese, trucker snacks and deviled eggs. Have eaten here in the past and thought the food was slightly better. Guessing Easter crowd had something to do with it. Absolutely enjoyed our time...we plan on returning! Fantastic place? Had a newborn with us and noise level was great and then they left as soon as live band started playing. Our waitress was PHENOMENAl-her name was Paulina and she was knowledgeable, patient and very understanding w our entire party. 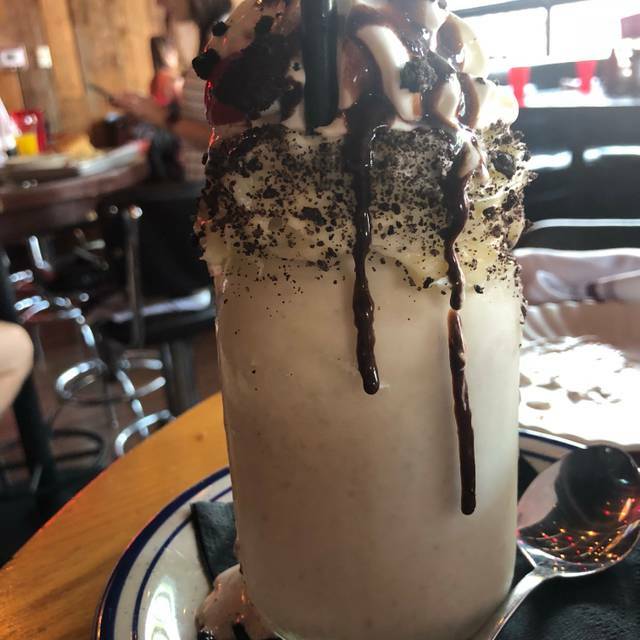 The food and drinks were great as well. While the service and ambiance were good, the food left a lot to be desired. I'll start by saying our server was great! She was polite and attentive, and even when our order got slightly messed up, she went above and beyond to make sure we were happy. She even had the mistakenly ordered meal taken off the bill. However, the food was less than average. I ordered breakfast tacos that were bland, but good enough, I guess. The portion size was good - 3 small egg and cheese tacos for $10 - so that made up for it. My friend ordered the brisket breakfast tacos (it says "tacos" on the menu) but she only got 1 taco for $15! I'm sorry, but I don't know of any restaurant in the entire country that charges $15 for 1 taco. It didn't matter because they brought the wrong taco anyway, so my friend ordered hash browns with a fried egg and brisket, to make up for it. The brisket was all fat and most of it was inedible. We were definitely disappointed in the quality of the food, and value overall. I'll come back to Bub City for the music, but I'll make sure I eat beforehand. The food came out wrong and it took a while for the waiter to come back to the table to address it. Then the food took a long time to come back out. It was very cramped, so we were listening to the conversations at both tables next to us. The service was outstanding. I have a severe fish allergy and they started a new fryer so I could have the fried chicken. Thank you so very much for doing this for me. It has only happened one other time in my life. The fried chicken was delicious. We will be back. 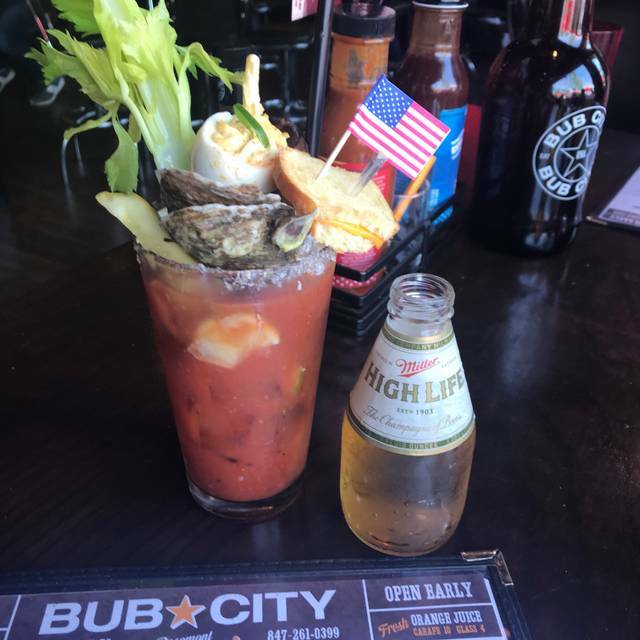 If you are looking for an energetic, lively restaurant with a bloody mary bar - this place is for you! It has a Nashville-like feel to it. 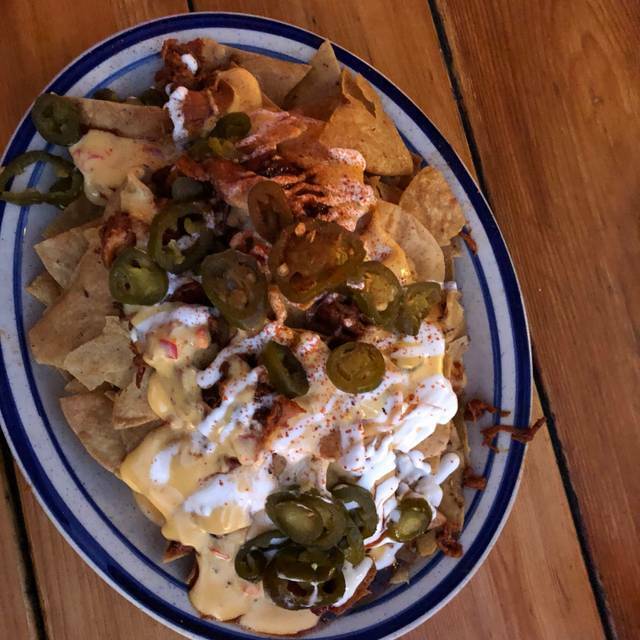 Stick with biscuit sandwiches, fried chicken, and nachos for menu items. We had a 7:30 reservations for 6 of us, with tickets to Zanies for 9:30 show. We were there by 7:15, but not seated till 7:55. We got appetizers quickly, but food order didn't come till 9:05. We had to remi d our waiter that we wanted to be out by 9:15. Unfortunately we had to rush through dinner. Bub City exceeded my expectations. I’ve been to a lot of good BBQ places but the atmosphere is usually dull and the real emphasis is on the food. Here they put a lot in making the environment lively. 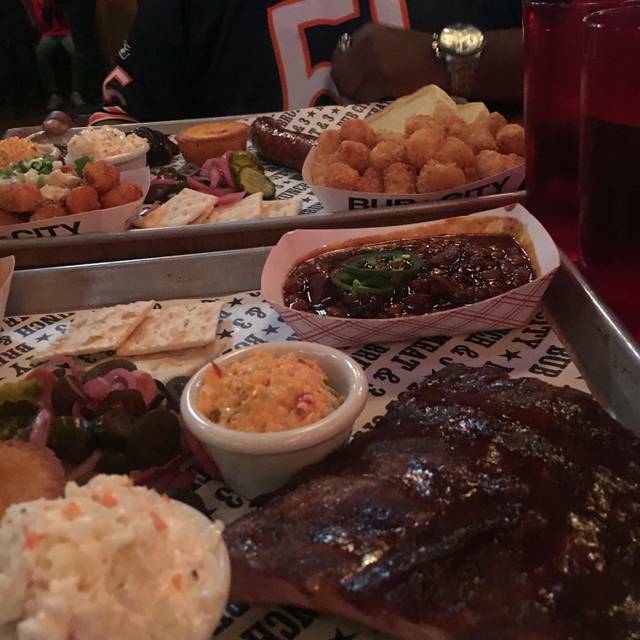 I ordered the ribs and they were excellent. And they also feature a wide variety of craft beer and a ton of whiskey. Cassie the server made the night excellent!!! Food was fast, drinks were great, music was good and then the live band later just made the whole experience amazing! I recommend this place and ask for the server Cassie! Our server was very helpful and the manager even stopped by to see how everything was and if there was anything we needed. Great experience as always! Our hosted knew we were going to a concert and took 15 minutes to come back with the check. Then she told us our parking was validated but it was not. We could not go back since we were running late for the concert already. The bbq was just ok. Wait staff were phenomenal! Very attentive, super friendly, and accommodating! Food was fantastic and all though we were close to the stage (a little too loud) the 2 man band were Great! We love the food and the live music there. Only negative is the exterior door being propped open and then everyone coming in the interior door let cold gusts of wind in. We had a table near the door and were freezing all night. The food here is amazing! 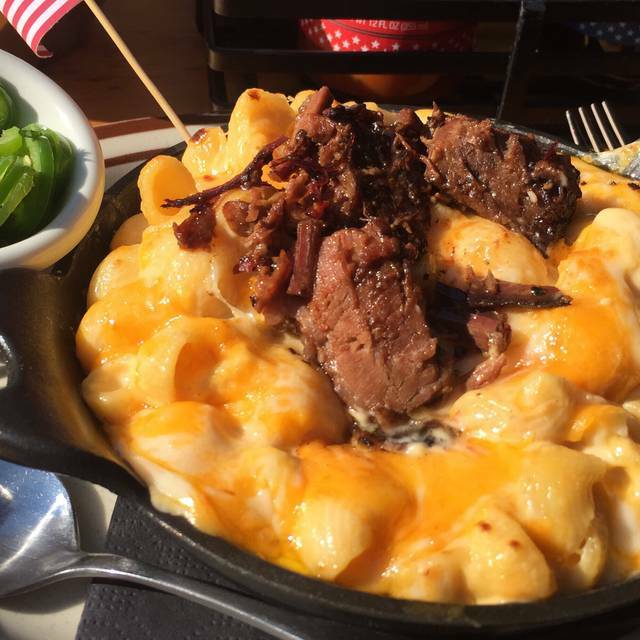 You definitely need to try the brisket and the mac and cheese. They have a decent beer list too. Our service wasn't bad, but definitely not above average. The atmosphere is really fun, so overall it was a great experience and we would go again. Been here a few times ! Service and food never fail. Perfect place for a night out with friends. We had a party of 8 and were dining before a show at Rosemont. Andrew was AWESOME! We had a wonderful meal and had plenty of time to get to the show on time. Our server was GREAT!! She was really nice and was very attentive. I believe the Manager also checked in on us. The food was delicious and will come back again. If you love bbq and a laid back atmosphere, this is a great place. Brisket, pulled pork and wings were really good. Table was ready right when we walked in. Staff was friendly. Drinks were strong. We enjoyed our experience very much! Perfect Sunday funday! Awsome great service we’ll be back soon! I made a reservation for Bub City for 4 people a month ago. Very disappointed to be put at a tiny round high top table in the far back corner of not the Bub City restaurant but the Joe’s Live Bar. There wasn’t even enough room for the app and dinner plates to fit for all of us. Our server informed us that this side bar was used for overflow walk ins and when I explained we were a reservation made well in advance he apologized and said he would bring it to his manager’s attention. No manager ever bothered to come over to our table and speak to us. Great experience! Our server Samuel B was outstanding, very nice and exceptional in the busy environment. Had a great time! Enjoyed the music, drinks, and food. Walked right in and was seated immediately. Nice staff and good atmosphere. Andrew was my server and he was absolutely outstanding. He was spot on, taking great care of us & his recommendations were all well received. Extremely knowledgeable of the menu. This was my first time here and didn’t know what to expect. The food was great, the whiskey flight was generous in portions and the live music was fun and lively. I will be back with a larger party very soon. The food was excellent as was the service. Had a reservation for 3:30 pm. Upon arrival, was told they needed the table back by 4:10. Gives 40 minutes to sit down, order, eat and then expected to rush. I expressed my disagreement with the hostess, and she was useless. Simply said “that’s what my manager said”. Complete disbelief. I will never go again. Servers were awesome and the menu is delicious and fun. 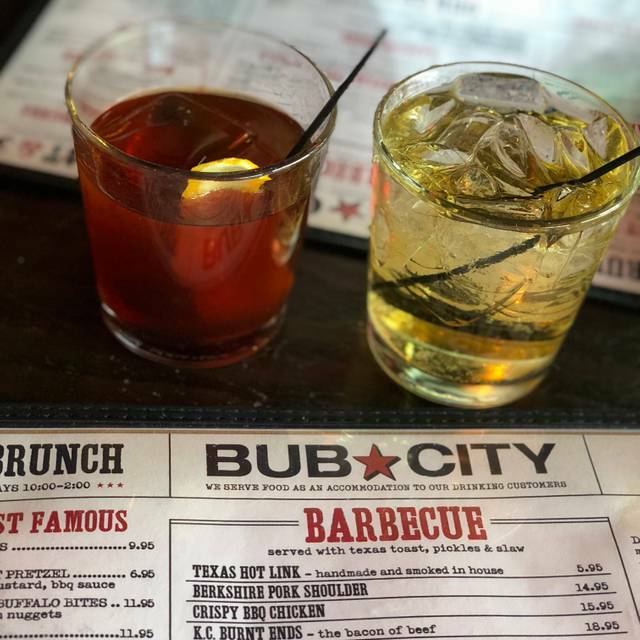 Bub City is a restaurant Chicago can be proud of. Main courses were perfect (brisket & ribs) and the dessert was amazing (and a birthday surprise): chocolate with whipped peanut butter topping. Something different and fairly decent brisket. Good service! Our server was incredibly wonderful. The food was great (however, there were no healthy choices on the menu). The live music was fantastic!!!! Excellent service, and we were able to reserve a huge booth for 8 people. The restaurant was clean, service was prompt and friendly, and the food was delicious. I had the macaroni and cheese and my husband had one of their chicken items. The fried pickles were crispy, and the beers were cold. I would recommend this place to families for lunch or an early dinner. It seems to really perk up during the evening. Didn’t really accommodate for the special occasion, but they were perfect! Loved it!